Every time I wear Fou d'Absinthe, the 2006 Olivia Giacobetti fragrance from L'Artisan Parfumeur I wonder why I don't have a full bottle of this green goodness. The husband is also a fan, and why not? It's green and spicy, cool and piney, while still retaining an almost incensy woody warmth. 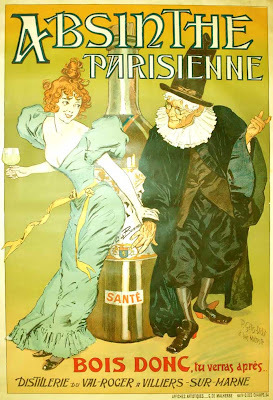 I remember several times visiting the L'Artisan store (when we still had a free-standing one in NYC) contemplating getting a bottle and always leaving with something else. 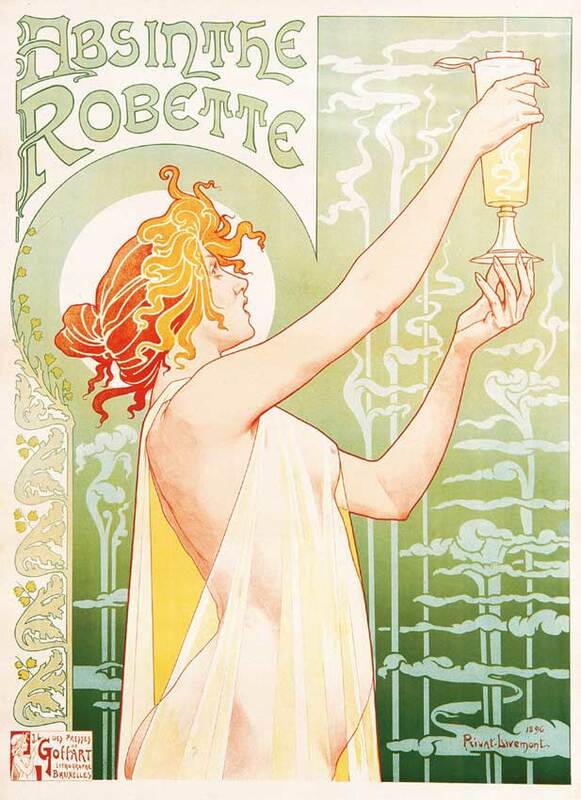 Part of the reason is that the idea of Fou d'Absinthe is more magical than the fragrance itself. 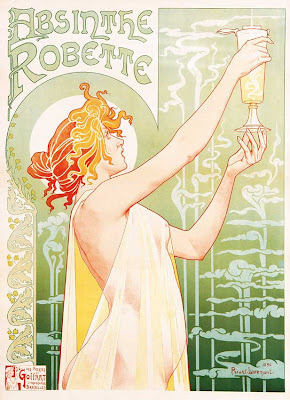 Art Nouveau absinthe ads, turn of the (previous) century artists, bohemian Paris on all its illicit pleasures... the sum of the fantasy is a bit too big for this green and mildly soapy fragrance. It's more than a little unfair, though, as Fou d'Absinthe is a terrific perfume for what it is: an incredibly balanced (this is a Giacobetti perfume, after all) spicy green scent that leans a bit dark at times, yet it's easy to wear and is awesomely unisex. The spice blend and peppery incense are more dominant than the absinthe-anise accord, which is probably why I have yet to succumb. I love incense, of course, on all its facets from soapy to smoky (L'Artisan's Fou d'Absinthe is decidedly of the former persuasion). I would have been irrevocably smitten if this was bolder, smokier and a lot more absinthe-like. Right this moment as I sit here drenched in my eleventy seventh sample I'm once again kicking myself for not having more. We'll see how I feel tomorrow. Notes: absinthe, star anise, dry pine, cistus, angelica flower, blackcurrant buds, clove, ginger, nutmeg, patchouli, pepper, pine needles, fir balsam. L'Artisan Parfumeur Fou d'Absinthe ($120, 50ml EDP) is available from MiN NY, Henri Bendel, Barneys and all the other usual suspects. 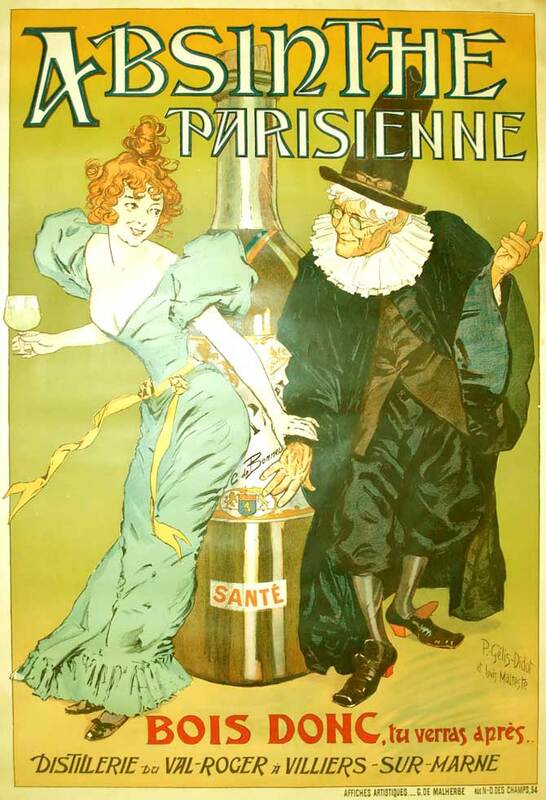 Absinthe posters from various online auctions.